Buoy your understanding of density. 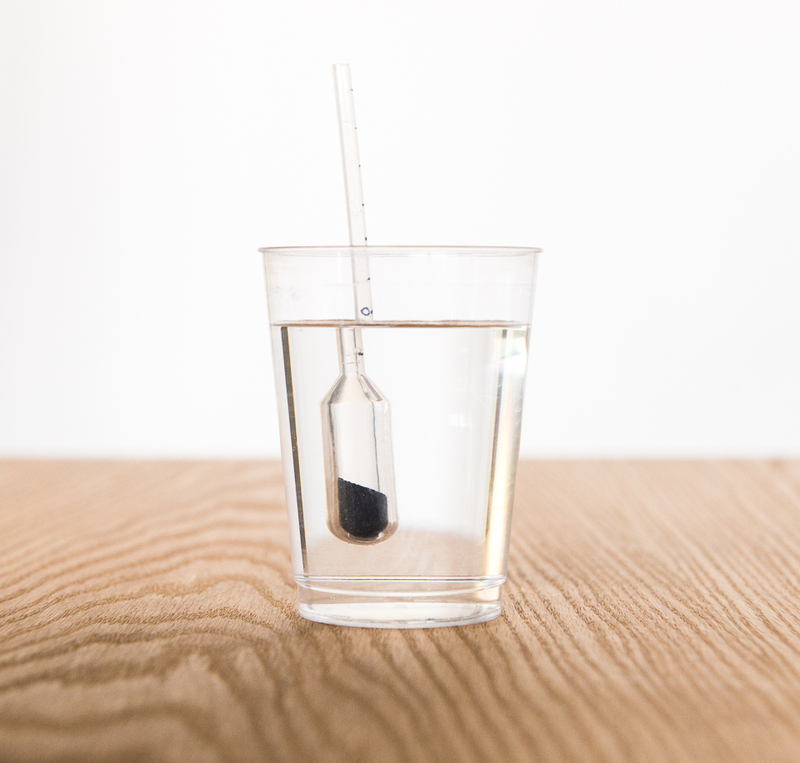 Construct a simple hydrometer that you can use to compare the densities of different solutions. Cut the tapered tip off of the pipet. The opening needs to be large enough so you can pour sand into it. Make marks along the stem of the pipet at centimeter intervals. Using a paper funnel, pour sand into the pipet so that it collects in the bulb. The photo below shows what your final product should look like (click to enlarge). Place the pipet bulb-side down in a beaker of water. Adjust the amount of sand in the bulb so that the pipet floats with the waterline roughly at the center of the stem. Cover the pipet opening with a small piece of tape. Notice where the surface of the water touches the stem of the pipet. Using the permanent marker, mark this point on the pipet—this is your zero-reference point. You’ve just made your eyedropper hydrometer! Now it’s time to test it. Make a salt-water solution and place your hydrometer in it. Using your zero-reference point as a guide, is the hydrometer sitting higher or lower in this new solution? How does this change when you change the concentration of salt? A hydrometer measures the relative density of different liquids. When an object floats in a liquid—when it is neutrally buoyant—the upward force of the liquid perfectly balances the downward force of gravity on the object, better known as its weight. According to the Archimedes’ principle, this force is equal to the weight of the fluid that the object displaces. This means the volume of the fluid that used to be in the space that the floating object now occupies weighs the same as the floating object. The force required to keep your hydrometer buoyant is dependent on the hydrometer's shape, mass, and volume. When it is placed in fluid, it will sink until it displaces enough fluid to balance this force. The amount displaced will be a fixed mass of fluid, regardless of the fluid. Therefore, the volume of fluid displaced depends on the fluid’s density. You may have noticed that your hydrometer floated higher in the salt-water solution. This is because adding salt to water makes the solution more dense. If a fluid is less dense, the hydrometer will need to displace more fluid to reach the balancing point between upward and downward force, so it sinks deeper into the fluid. If the fluid is more dense, such as the salt-water solution, the volume the hydrometer needs to displace will be less, so it floats higher. By using water as your zero-reference point, you can calibrate your hydrometer to show the relative density of liquids compared to water. Try testing different concentrations of salt water or even other liquids, such as corn syrup, oil, or alcohol. This density column always returns to its original three layers.